Electronic groupsets are no longer reserved for the pros and have found their way onto many consumer bikes. SRAM’s eTap groupset, launched in 2015, was the first electric groupset to really change rider experience, with paddle shifting not dissimilar to what you’d find in a sports car as opposed to the traditional one-lever-per-derailleur approach we’ve come to expect. Riders are pushing their drop-bar bikes harder and taking them further afield than ever before (just look at some of our missions) and SRAM’s latest iteration of the eTap groupset, now named SRAM Red eTap AXS (pronounced ‘access’) was developed with this in mind. With a new expanded 12-speed range, clutch (kind of) rear derailleur and 1x compatible crankset eTap AXS has an option to suit all riding styles. Before I moved to the clean and pristine world of media, I spent my days getting my hands dirty wrenching on bikes and have installed my fair-share of Red eTap groupsets. I managed to get my now-clean hands on an eTap AXS groupset and below you’ll find my first, hands on impressions of the groupset. 12 gears, that’s what. The other key fundamental difference, compared to the first iteration of eTap is the AXS app. From your smartphone you can check battery status, change component behaviour, personalise the controls to your liking, get maintenance prompts and update your firmware. No more USB dongle! If you’ve seen an eTap front derailleur up close, the new eTap AXS derailleur isn’t much different. The new front derailleur is a little bit more streamlined and looks a touch more elegant on the bike with the new, slightly smaller battery. As expected, it makes use of SRAM’s YAW technology. The streamlining of the derailleur does offer more tyre clearance, something that was an issue with gravel/CX riders wanting to make use of the first eTap groupset. SRAM have taken a ‘one derailleur to do it all’ approach with the eTap AXS rear derailleur. No short or long cage variants and no 1x variant. Thanks to the new Orbit chain management technology, which is essentially a clutch, the derailleur will hold its own on a traditional 2x road setup and be equally at home on a gravel 1x setup. 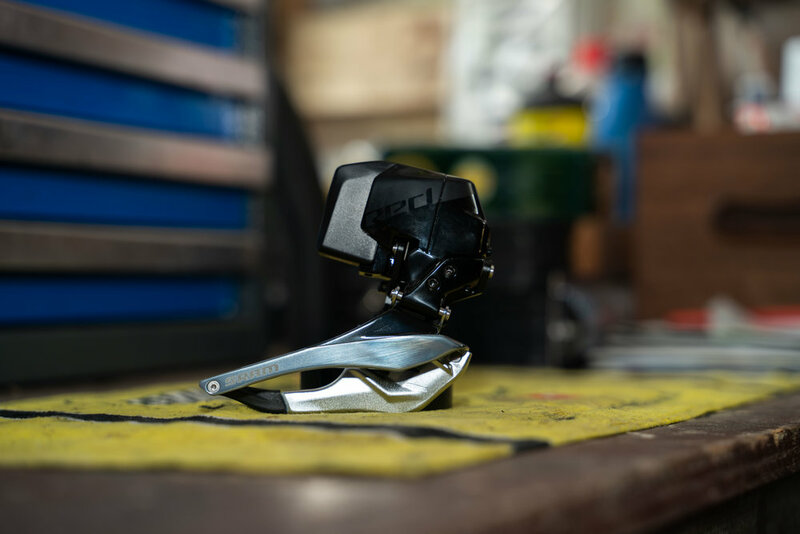 Like the front derailleur, the rear derailleur has had a few minor cosmetic refinements and also features larger X-SYNC pulleys with ceramic bearings to keeping your chain spinning smoothly. Some disciplines are suited perfectly for 1x drivetrains: CX, time trial and triathlon for example. SRAM understand this and have introduced a 1x crankset with the AXS groupset. All the chainrings are now direct mount, whether you’re operating a 1x or a 2x setup and the new 2x rings are also now a one-piece construction meaning when one needs replacing, both need replacing. The crankset can be upgraded to a power meter easily, with SRAM offering a power meter that functions as the spider on their chainrings – simply unbolt your chainrings and slide on the new power meter. I haven’t gotten my hands on the rim-brake lever yet, but the hydraulic lever does feel a little better in the hand than the original eTap hydraulic lever. SRAM have added a textured rubber grip to the shift paddle which is a nice touch, and with separate pad contact and reach adjustment the eTap AXS lever offers plenty of adjustment to suit riders with all hand sizes. The eTap AXS brake calliper offers more or less the same experience as the SRAM Red hydraulic callipers. They’re available in both flat mount and post mount so will fit anything, and also now feature Bleeding Edge technology; something your mechanic will care about, and you will not. A couple of other minor things, SRAM’s released a new chain with a flat top for reasons that probably aren’t interesting to you, but are essential keeping your new groupset running smoothly. A new road-optimised Centreline XR rotor was added to the line up with rounded edges and a central cooling surface , leaving the Centreline X rotor for CX, gravel and bike packing.